Analysis: Hodges couldn't make the Steelers 53-man roster to begin the season and landed on their practice squad. The 2017 sixth-round pick had 48 catches for 691 yards and seven touchdowns in his final season at Virginia Tech but has yet to play in an NFL game. Hodges may see a spot open if Xavier Grimble moves on from Pittsburgh after the season, but Hodges won't have many opportunities with Vance McDonald and Jesse James under contract in 2019. Analysis: The 2017 sixth-rounder went unclaimed on waivers and joined the Steelers' practice squad. He'll be a candidate for a promotion to the active roster if Vance McDonald (foot), Jesse James (back), or Xavier Grimble (wrist) suffer any setbacks. Analysis: Hodges showed promise in college at Virginia Tech, converting to tight end after being recruited as a quarterback. However, he's yet to convert that potential into NFL production. He'll now look to secure a depth and special teams role with Pittsburgh in 2018. Analysis: Hodges was waived to make room for running back George Atkinson. If Hodges clears waivers, he'll become a free agent and will look to secure a depth tight end and special teams role with a team in 2018. 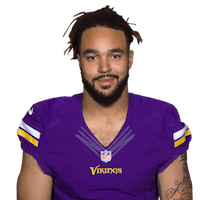 Analysis: Hodges, a sixth-round selection in the 2017 Draft, was waived-injured by the Vikings back in September and then spent six weeks on the Panthers' practice squad. He'll now compete with Neal Sterling and Jordan Leggett for a reserve tight end role this season. There are no videos available for Bucky Hodges. Click here to view all videos.